Americans did not initially have much faith in the Monitor. Few believed that this strange little vessel could hold her own against the formidable Confederate ironclad Virginia, which had been built on the bones of the scuttled USS Merrimack in Portsmouth, Virginia. The Virginia, seemingly relentless and unstoppable, had ravaged the U.S. Navy in Hampton Roads on March 8, just before the Monitor arrived. Yet the following day, the “cheesebox on a raft” proved her Union mettle, becoming a national hero in her own right. For the remainder of the Civil War the Union Navy used dozens of monitor-style vessels on inland waters as well as at sea. But there would always be only one first Monitor, and she became affectionately known to many throughout the nation as “Our Little Monitor.” Her loss off Cape Hatteras on December 31, 1862, was mourned as keenly in the press as the loss of 16 of her men that night. 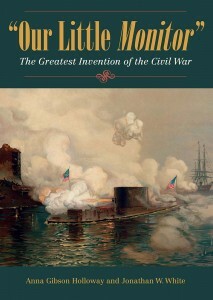 Using the latest archaeological finds from the USS Monitor Center in Newport News, Virginia, as well as untapped archival material, Anna Gibson Holloway and Jonathan W. White bring “Our Little Monitor” to life once more in this beautifully illustrated volume. In addition to telling her story from conception in 1861 to sinking in 1862, as well as her recent recovery and ongoing restoration, they explain how fighting in this new “machine” changed the experience of her crew and reveal how the Monitor became “the pet of the people”—a vessel celebrated in prints, tokens, and household bric-a-brac; a marketing tool; and a prominent feature in parades, Sanitary Fairs, and politics. AuthorAnna Gibson Holloway is the former curator of the awardwinning USS Monitor Center at The Mariners’ Museum in Newport News, Virginia. She holds a Ph.D. in history from the College of William & Mary and is a leading expert on the Civil War ironclad USS Monitor. Her articles have appeared in American Heritage, America’s Civil War, Civil War Times, and Naval History Magazine. She currently serves as the maritime historian for the National Park Service’s Maritime Heritage Program in Washington, D.C.